Need help organizing a large event? How to Plan a Great Event in 60 Days is a step-by-step guide that takes the guesswork out of planning social events. Designed for people with little or no event planning experience, this book covers specific aspects of the event planning process. Each week is filled with easy-to-follow exercises and instructions designed to help you create a wonderful event experience from start to finish. From setting a solid foundation for your event, to securing a venue, to dealing with vendors, to preparing invitations, you’ll learn how to steadily and seamlessly build your event from the bottom up….almost as if by magic! Whether you’re planning your own wedding reception, a retirement luncheon for a friend, or your family’s annual reunion, you can’t afford to miss the information in this helpful book. With clear, well-organized instructions and practical tips, you’ll have everything you need to quickly and successfully plan an amazing event. I don’t think my genre is particularly different from other genres. Just like other non-fiction or fiction authors, I have to do a lot of planning and organizing of material to make sure concepts and ideas are presented in a logical fashion. If pressed for an answer however, I’d say I have to consider many different concerns or issues the reader might face in the planning process. That is, I almost have to try and answer readers’ questions ahead of time, in a way! If you want to write, write! There’s no substitution for the plain act of writing. You’ll get better at it over time, but the key thing is to just get started and keep at it. Rashelle Isip is an organization, time management and productivity blogger, author and consultant who loves bringing order and balance to people’s lives. She is the founder of The Order Expert, a site featuring practical tips, ideas and inspiration to help people “kick chaos to the curb.” In addition to her work on The Order Expert, Rashelle is a regular guest contributor to the productivity blog LifeHack, has guest blogged for Time Management Ninja and Healthy Women, and has been featured in Fast Company and STYLIST Magazine. I enjoy helping people solve problems, plus, I’ve always wanted to write a book. In fact, I started my organization, time management and productivity blog, www.TheOrderExpert.com, on the way to writing a book. 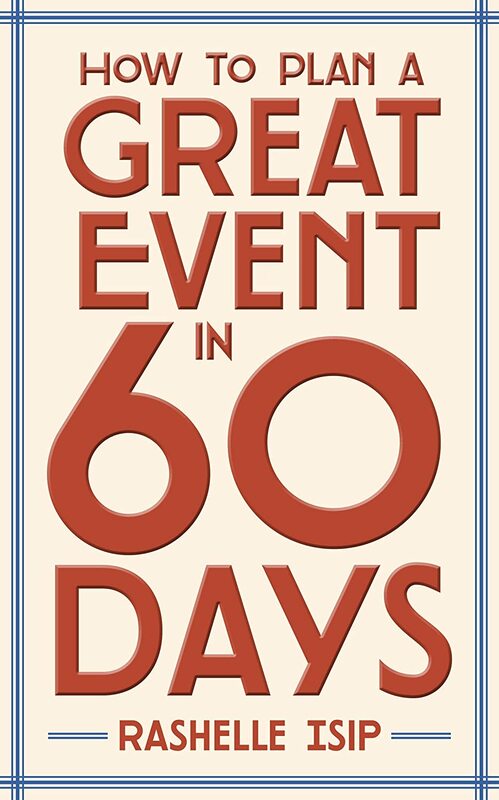 “How to Plan a Great Event in 60 Days” is the result of all my event planning experiences as a public relations executive. Having gone through the event planning process myself numerous times, I thought it would be interesting to write a guidebook for others to help them easily plan an event.